Uber is teaming up with NASA on part of the project, but the ambitious concept still faces quite a few technological and regulatory obstacles. In its efforts to take to the skies, Uber says it's partnering with NASA. The space agency will reportedly help design an air traffic control system for Uber's future airborne ride-hailing service called Elevate. Uber still has a long way to go to get this flying car concept off the ground. 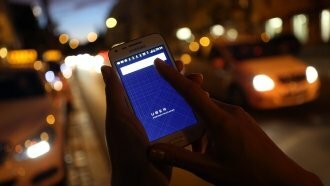 The company announced its plan for Uber Elevate in a 98-page paper it released in October 2016. And it said earlier this year it teamed up with multiple companies — ranging from aircraft manufacturers to a company that makes electric car chargers — to get the project going. But The Verge notes the type of flying vehicle Uber wants to use doesn't exist yet. It's an electric autonomous aircraft that can take off and land vertically. And Uber still needs to get approval from regulatory agencies, like the Federal Aviation Administration. Despite all this, Uber is currently sticking with its ambitious deadline of testing its flying taxi service in 2020. On Wednesday, the ride-sharing service said Los Angeles will be the third city in its pilot program, which already includes Dallas-Fort Worth and Dubai.